The all whole-bunch 2016 Chateauneuf du Pape Chante le Merle Vieilles Vignes is 85% Grenache, with the balance a mix of Mourvèdre and Syrah. The vines are all 80 to 90 years old, selected from parcels in Brusquières, Gardiole, Mont-Redon and Pignan. Glorious raspberry and cherry fruit picks up hints of mint and some stemmy notes, but they're remarkably well-integrated and should be completely absorbed within a couple of years. Full-bodied, rich and creamy in texture, this tour de force remains lively, silky and long on the finish. With 1,000 cases produced, it should be reasonably priced and reasonably available—an increasingly rare combination in Châteauneuf-du-Pape. 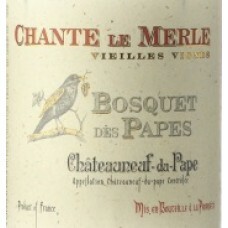 The 2016 Châteauneuf-du-Pape Chante Le Merle Vieilles Vignes is much more classic in style when compared to the La Gloire de Mon Grand-Père. It’s a non-destemmed blend of 86% Grenache and the balance equal parts Mourvèdre and Syrah, aged in a mix of foudre, concrete tanks, and demi-muids. Classic notes of black fruits, smoked herbs, seaweed, licorice, and pepper as well tons of minerality all emerge from this powerful, full-bodied, structured 2016 that has the purity of fruit and balance that’s the hallmark of this great, great vintage. Forget bottles for 4-5 years and enjoy over the following two decades.